The NDA Socio-economic fund will contribute to the development and refurbishment of the harbour’s St Ola’s Pier, increasing its capacity to receive larger vessels. The improvement work is likely to generate up to 50 new jobs, increase traffic through the port and attract visitors – providing a boost to the region’s tourism economy. Supporting the communities around our sites is a fundamental part of the NDA’s mission to clean up the UK’s nuclear legacy. Scrabster is already amongst the UK’s most important ports, supporting fishing, oil and renewables industries and providing a vital ferry link to Orkney. It is understood that the programme of improvements, worth £17million in total, could increase revenue for Scrabster Harbour by 18% over 5 years. Work will include dredging, to increase the depth of the water, and modifications to the pier itself – meaning larger vessels are able berth at the pier. 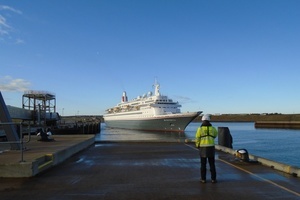 Scrabster is a Trust port overseen by a Board of Management appointed from the local community. All surpluses generated from the harbour operation are reinvested in the port and its infrastructure. The Caithness & North Sutherland Regeneration Partnership (CNSRP) was set up in 2008 to address the economic impact that the work to decommission the Dounreay site would have on the North Highland area. We have made good progress in our efforts to move the economies of Caithness and North Sutherland away from their dependence on Dounreay. Both Scrabster and Wick harbours have been an important part of the Regeneration Partnership’s work, and today’s news will reinforce the importance of marine activities in the region. The award of £5m to Scrabster Harbour, by the NDA, will significantly improve the capacity of this key strategic asset.